These juicy grilled burgers are perfect for a summer cookout or any festive occasion. Top them off with sliced tomatoes, pickles, and red onions, or add some bacon to your toppings. Tomato juice and Worcestershire sauce add to the flavor and juiciness of these hamburgers. If you like a flavorful burger, this recipe is an excellent choice. The burgers are made with a small amount of bread crumbs, grated onion, tomato juice (we used V-8), and some simple seasonings. See the tips and variations below the recipe for some extra flavor ideas and burger shaping as well as cooking tips! Combine the ground beef with bread crumbs, Worcestershire sauce, grated onion, garlic powder, and tomato juice. Mix well. Shape the ground beef into 4 to 5 large burger patties. Sprinkle both sides of burgers lightly with seasoned salt and pepper. Prepare your gas or charcoal grill for high heat and oil the grate with vegetable oil. Place the burgers on a foil-lined pan. Cover and refrigerate until the grill is ready. Put burgers on the prepared grill over direct heat. Grill the burgers for about 5 to 7 minutes on each side, or until cooked as desired. Serve on toasted buns with your choice of sliced vegetables and other condiments. 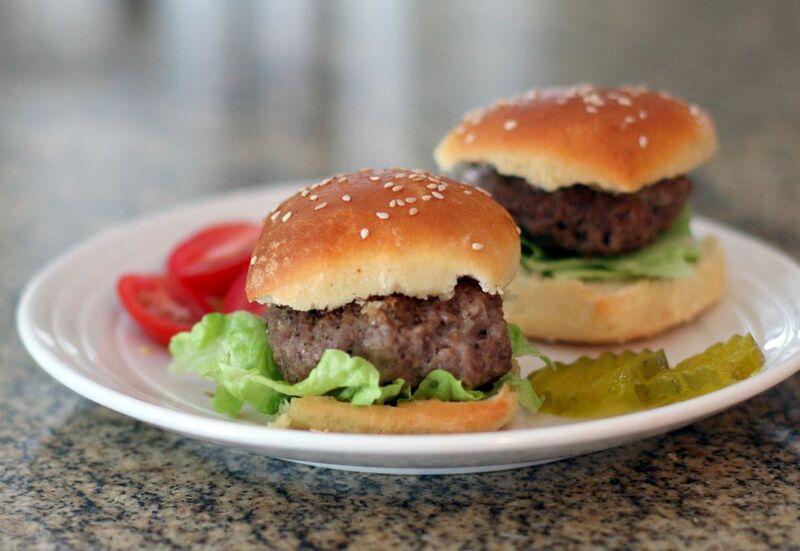 Weigh your burgers as you shape them for uniform size and even cooking. Using your thumb or a finger, make an indention in the center of each patty, especially if they're quite thick. This will help it stay flat and cook evenly. Grind your own beef. Choose chuck steak or cubes or boneless short ribs, or another cut with good flavor and a decent amount of fat. Use an instant-read food thermometer to check the burger temperature. An inexpensive instant-read thermometer is fine, but if you use a food thermometer frequently, consider the ThermoWorks Thermapen. It's super fast and reliable! Keep in mind that Foodsafety.gov recommends a minimum safe temperature of 160 F for ground beef or 165 F for ground poultry.